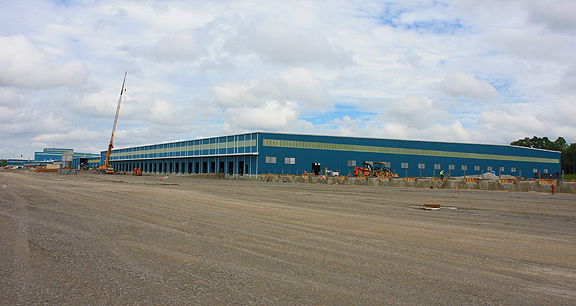 Project obstacles and solutions: Mohawk Industries announced in 2014 that it would build a new ceramic tile manufacturing plant in Dickson, Tennessee. The $180 million project would house its Dal-Tile operations and would be Mohawk's ninth ceramic tile plant in the U.S. The plans for the new facility called for 1.8 million square feet under roof, all built with concrete. D.F. Chase was selected as the general contractor for this project and Jay-Ton Concrete Construction poured all of the slabs-on-grade and walls within the facility. Dickson County economic development leaders had worked for two years to secure the Dal-Tile plant location. It was the largest economic incentive deal ever negotiated by the county. Located 40 miles west of Nashville, Dickson is a medium-sized city with a strong manufacturing base. However, it is far enough away from Nashville that concrete delivery from the metro area was not going to work. This project called for 38,000 yards of concrete. A portion of the plant was to be operational 24 months after ground was broken. The demand for concrete would be large and it needed to be consistent. There was no room in the construction schedule for delays in delivery of concrete or loads that did not meet engineering specifications. The IMI concrete plant in Dickson is a dry batch plant. Typically in jobs of this size, two or more dry batch plants would supply the concrete. In this situation, IMI plant personnel were able to reconfigure work loads to make sure that all of the concrete came out of the Dickson plant. Dispatch, drivers and plant management worked together to make sure that concrete demands were met for all of the slab and wall pours. The Dickson Dal-Tile plant began production in April 2016. For more information on concrete delivery schedules for your project, contact the sales representative for the concrete plant nearest your location. Click here.